One of Norway’s largest congress facilities and among the world’s most environmentally friendly buildings. 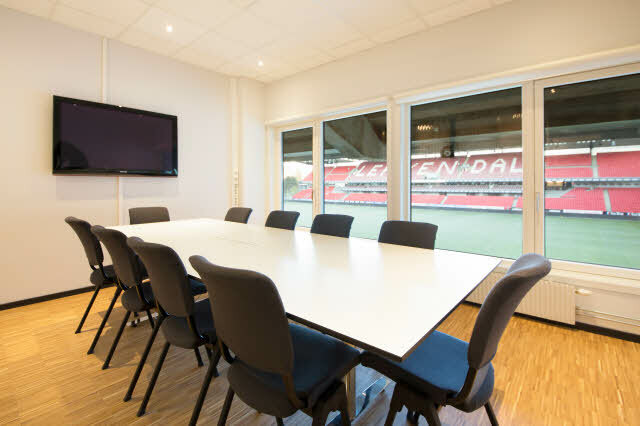 With ties to Lerkendal Stadium, the hotel has access to Norway’s largest venue for meetings and conferences. Book your next conference and invite up to 23,000 guests on your participant list. Stay in one of Norway’s tallest hotels and enjoy panoramic views over Lerkendal stadium from the 20th floor. The hotel has access to Lerkendal’s facilities with capacity for 23,000 people and a 1420-sqm main room, which can be divided into 3. Book your next meeting in the VIP lodge, enjoy all meals throughout the day at our restaurant and finish off the evening at Bar & Bistro. We adapt to your needs and tailor your event to ensure you get the best possible experience. There is free WiFi for all hotel guests. Right by Lerkendal stadium and a short drive from Trondheim’s centre, Scandic Lerkendal is perfect for anyone wishing to combine their next event with everything the city has to offer. Why not set aside some time for a tour of the city? There’s shopping, football matches and sights to see such as Nidarosdomen cathedral, the Bakklandet district and the old town bridge, Gamle bybro. If you are arriving by car, the hotel is located about 30 minutes from Trondheim airport and about 10 minutes from Trondheim train station. Scandic Lerkendal will be the largest conference facility in the Nordic region, and a unique meeting place in Trondheim. We can facilitate everything from small meetings to large international conventions.